With all of the guests we've had this past week, I just now found time to stamp!! I hate when I haven't stamped in about a week and I finally sit down to do it and nothing. Just nothing. I sit there and it's like I'm stamping for the first time all over again!! Does that happen to anyone else or am I the only weirdo?? I finally got to use my new Verve Visual stamps. I also got the sketch from Julee's blog. I love that it's easy to line them up, like I did here, to make your own dp! And no, I did not use a stampamajig!! Just eyeballed it! The larger vanilla panel was scored in a grid sort of pattern using my plain ol' cutter. I pierced around part of the choc layer. The sentiment is from Baroque Motifs. Pretty simple card, but I'm happy with it even if it did take me a while to get into somewhat of a groove. Thanks for stopping by! Oh! What do you think of the new banner up top? I dunno if I like it 100%, but maybe it'll grow on me. card info: stamps ~ Verve Visual, Baroque Motifs. paper ~ sage, vanilla, choc. ink ~ choc. access. ~ piercer, wide organdy ribbon, brad, punch, scoring blade. 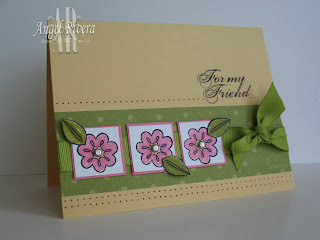 A quick card for the Featured Stamper challenge this past Sunday. Dawnsing (Dawn McVey) was this weeks choice and man, she has such a great gallery. I used the apricot dp from the level 1 hostess set. I colored in the flower from One of a Kind with ruby, regal rose and apricot markers. There's a build a brad in the center (I sure hope those make the new catty!!!). Added extra piercing than Dawn's card had, but kept pretty much everything else the same. Ok, the first of our many guests this month has arrived, so not sure how much stamping I'll get in over the next couple of weeks. (I'm sure I'll be able to sneak some here and there...) Thanks for stopping by! And thanks Deb for the help with the siggy!!! 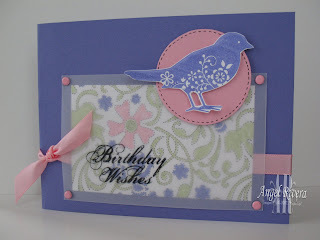 card info: stamps ~ one of a kind, short and sweet. paper ~ kraft, regal, ww, apricot dp. ink ~ black. access. ~ markers, piercer, punch, build a brad, ribbon. I have to admit that I don't usually participate in the Inspiration Challenges over on SCS because Saturdays are usually so busy, it's just not possible. But these just really struck me and I knew what I wanted to do as soon as I saw them. I haven't used this set in quite some time, but I still love it. I masked the flowers when I stamped the leaves, which were stamped off once before stamping onto the cardstock. I sponged around the Summer Sun panel with basic black, especially around the bottom. I colored in the flowers with my summer sun marker to make them stand out a little more. I sponged around the sentiment with black and summer sun. I have to say it again, I just *love* this sentiment set, Elegant Cheer! I received the dew drops in my Spring Fling package from my *flower*, Dawn (thanks!!!!!). I pierced around the edge of the base and added brads. My dh even said this was the prettiest card he thinks I've ever made! Not sure if that's a good thing, but whatever, I'll take the compliment!!! Have a great weekend!!!!!!!! card info: stamps ~ touch of nature, elegant cheer. paper ~ ww, black, summer sun. ink ~ black, summer sun. access. ~ markers, hardware, ribbon, brads, piercer, sponges. I've been seeing and hearing about "inchies" for a while now and just never paid much attention. Well, today's Ways to Use it challenge was to use inchies, which are simply 1" squares. I decided to use this flower from the Bud Basics set because I knew it would fit onto a 1" square. I colored them with regal rose and saffron markers. I colored the leaves with olive, then cut them out and added them here and there. I used vintage brads for the flower centers. I totally love this new sentiment set I got, Elegant Cheer! The font is so pretty! Of course, I had to add some piercing. I love the simple look of this. Well, we just got home from watching 2 of the boys' ball games ~ both lost and the middle one is done for the season. I'm bummed they lost, but at the same time I'm grateful that I have a little less running around to do now!! Am I a bad mom or what?!! hehe! Thanks for checking in! card info: stamps ~ bud basics, elegant cheer. paper ~ saffron, ww, regal, dp. ink ~ black. access. ~ markers, brads, ribbon, piercer. Ok, not really! But those were the colors for today's color challenge! Lots of sponging on this card. I colored the flower with ruby and pumpkin markers first, then went over it with ink from inkpads and a watercolor brush. I stamped the baroque swirl on the sentiment with pumpkin ink that was stamped off once first. Then I sponged around it with ruby ink. I like this sketch I used ~ feel free to use it and if you do, post a link to your card here so I can check it out!! 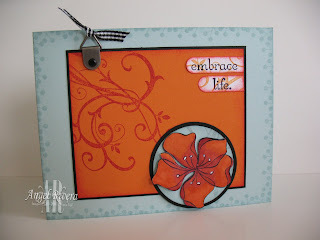 card info: stamps ~ embrace life, baroque motifs, always. paper ~ sky, black, pumpkin, ww. ink ~ same as paper. access. ~ coluzzle, gingham, hardware, punch, white gel pen, sponge. HIIII! Today's color challenge was lilac, pink and celery. Perfect for spring! I didn't even know where to start, so this card just kind of evolved as I went along. I colored in parts of the Stitched bg with markers, but thought it looked to bright, so I added a layer of vellum. 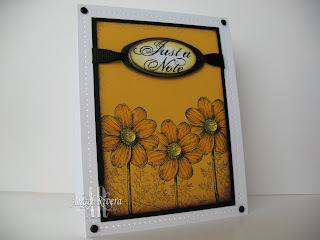 I so love the soft look vellum gives to anything! I used black stazon ink for the sentiment. Very feminine, I think. Baseball season is slooooowly winding down, though we still have the playoffs. Then at the end of the month, we have a bunch (ok, really only 4) of people coming to stay with us, the most important one being my mom!!! Yes, she's finally coming out because she's going to have the walk through of her house and then the closing of her house at the end of the month. Then around the 30th, all of her stuff gets here! Oh my word, I still can't believe she's moving out here. It'll be such an emotional roller coaster ride for a while, but at least we'll be close enough to be able to help each other get through everything that's been dealt our way over the past year. This has to be the beginning of better times, right?? card info: stamps ~ stitched bg, always, elegant cheer. paper ~ lilac, pink, ww, vellum. ink ~ black stazon, black. access. ~ markers, ribbon, brads, coluzzle for the circle.